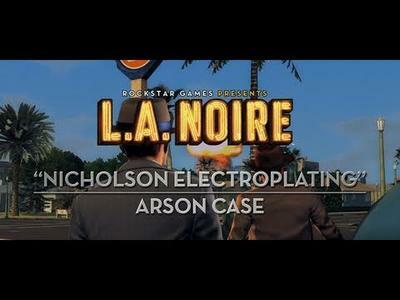 aThe first non-pre-order related case DLC for L.A. Noire is set to release for both the PSN and Xbox LIVE Arcade next week for $3.99 or 400 Points. If you've already picked up the Rockstar Pass for around $10, a deal which is still available, all past, present and future DLC is available at no extra charge. As the quick trailer above shows off, this case is centered around a massive explosion that destroys six city blocks and kills 17 people. Moreover, the famous Howard Hughes is involved somehow. Players will lace up their detective shoes as Cole Phelps for another stint on the Arson Desk. After completing L.A. Noire, I found the Arson Desk to be my favorite throughout the entire game. The types of cases involved with the detail and the partner at hand made it an exceptionally interesting affair. In fact, out of all the partners in the game, I found Biggs' personality to be the most engaging. He fit the tone of 1947 Los Angeles so perfectly that I didn't want to leave him. While I won't ruin the details of the game, I did find the Arson Desk section to be a little too short for comfort. As the credits rolled, I wished I had more fires to solve. This DLC grants that wish. And next week you better believe I'll be snagging the content and cracking the case post-haste. Will you?